Thanksgiving is upon us and many people decorate for Christmas at this time. So the question is, “What kind of Christmas Tree should I buy?” There is no “right” answer to that question. The “right” Christmas tree is very much a matter of personal taste, and consumers need to spend some time learning which species they prefer. Some species are easier to find than others. In Western North Carolina, Fraser Fir is by far the most available species and because they are grown here and make excellent cut trees, we tend to favor them. While all Christmas trees are needle-bearing evergreens, there is a great deal of variation among the species in overall appearance, needle and branch characteristics, needle retention, availability, and price. There can also be considerable variation between trees of the same species, depending on where the trees were grown and how they were managed. A tightly sheared blue spruce will, for example, look very different than one that has been lightly sheared throughout its life. For ease in identification, Christmas tree species can conveniently be divided into two groups – pines, such as Scotch and white pine, and the single-needle conifers, including the spruces and firs. While there are many differences between the two groups, the easiest way to tell them apart is by the way the needles are attached to the branches. All pines used as Christmas trees have their needles attached to branches in groups of two or more; all of the single- needle conifers have their needles individually attached to the branches. Other differences important to their use as Christmas trees include (1) pines generally have longer needles, (2) the branches of pines come off of the main stem at distinct intervals (termed whorls) while those of the single-needle conifers emerge all along the stem, and (3) pines grow on a wider variety of sites and have traditionally reached Christmas-tree size in fewer growing years. This latter characteristic undoubtedly has been responsible, at least in part, for pines historically being more popular among Christmas tree buyers – pines have been more available at a lower price. However, this trend has changed in recent years, with the single-needle conifers, particularly Fraser Firs, capturing an increasing share of the market. Many species of evergreens are sold as Christmas trees in various parts of the county either as cut trees, container plants or balled and burlapped. Fraser fir, Douglas-fir, Canaan fir, Scotch pine, eastern white pine, blue spruce, Norway spruce, Leyland cypress, Carolina Sapphire Cypress, white spruce, white fir, and balsam fir are all used as Christmas trees. Other conifers found locally such as Eastern Red Cedar and various short-leaved pines are also used sometimes. Characteristics of some of these follow. Scotch pine, an introduced species native to Europe and eastern Asia, historically was the most popular Christmas tree grown and sold throughout the United States, though its popularity has waned. It’s one- to three-inch-long, green to blue-green, somewhat stiff and twisted needles are attached to stiff branches in groups of two. Because a number of different varieties of Scotch pine are grown, considerable variation may be found in the Scotch pine sold as Christmas trees, particularly in needle length and color. Scotch pine is commonly sheared tightly to produce a tree with dense foliage, though trees with lighter shearing can be found. These trees have a more open appearance and more room for ornaments. Scotch pine has strong branches that will support abundant decorations and relatively heavy ornaments. The needle retention of cut Scotch pine is excellent, better than almost any other Christmas tree species. In fact, unlike most other Christmas tree species, Scotch pine tends to hold its needles even when the tree becomes very dry. Eastern white pine, a tree native to eastern North America, is the second most popular pine Christmas-tree species. Its two- to five-inch-long, yellow-green to blue-green, soft, flexible needles are attached to flexible branches in groups of five, giving the tree an almost delicate look when compared to many of the other pines, including Scotch. Two varieties of Eastern white pine with distinctly different appearances are commonly used for Christmas trees. Eastern white pine from northeastern U.S. seed sources (often referred to as Lake States seed sources) tend to have yellow-green to green needles that are somewhat shorter, while white pine from Southern Appalachian seed sources tend to have blue-green needles that are somewhat longer and have a drooping appearance. Like Scotch pine, eastern white pine is most commonly sheared fairly tightly, producing a tree with dense foliage, though more open trees can be found. Compared to Scotch pine, however, eastern white pine’s slender flexible branches will support fewer and smaller decorations. Needle retention of cut eastern white pine is very good to excellent. Blue spruce (Colorado spruce, Colorado blue spruce), a tree native to relatively high elevations in the mountains of the western United States, experiencing increasing popularity as a living Christmas tree to be planted after the holiday. Its 3/4 to 1-1/4 inch-long, stiff, very sharply pointed needles are attached individually to twigs and grow on small peg-like structures that remain on the twig after the needles have fallen (usually after the third or fourth year), producing a somewhat rough or bumpy feeling twig. The almost square cross-section of the blue-spruce needle allows it to be easily rolled between two fingers. The foliage color of individual blue-spruce trees varies from green to blue-green to silvery-white. The naturally symmetrical form of blue spruce allows an attractively shaped Christmas tree to often be produced with a minimum of shearing, enabling growers to produce attractive trees with a variety of densities. Blue spruce branches are relatively stiff and will support many decorations and relatively heavy ornaments. Needle retention is okay, though blue spruce will not tolerate a situation that allows the tree stand to occasionally go dry. If that happens, a great many needles drop. If blue spruce has a major drawback as a Christmas tree, it is its sharp, stiff needles that make it difficult to handle and may make it an inappropriate choice for homes with small children. Fraser fir, a tree native to the high elevations of the southern Appalachian Mountains, is a fragrant, dark-green Christmas tree species whose popularity has increased dramatically in recent years. Fraser fir’s one-half to one-inch-long flattened needles are attached individually to the twigs. However, unlike spruce, the needles of Fraser and other firs are attached directly to the twigs, rather than on peg-like structures as are the spruce. As a result, when the needles fall off a Fraser fir branch, the surface of the branch is smooth rather than rough or bumpy like the branch of a spruce. Also, the flattened Fraser fir needle will not easily roll between two fingers. The upper surface of Fraser fir needles is generally dark green with a visible groove down the center, while the lower surface is a lighter green with two silvery-white bands. The needles on the upper branches are somewhat pointed and tend to curl upward around the twigs in a U-shaped fashion, giving the branch a bottle-brush appearance, while the needles on the lower branches are more blunt and appear to extend out from the twigs from the sides, giving the lower branches a flattened appearance. Among Fraser fir’s strong attributes as a Christmas tree are its strong natural symmetry, allowing the production of attractive trees with a wide range in density; its relatively strong branches to support decorations; and its attractive, deep green, relatively soft foliage. Also the needle retention of cut Fraser fir is excellent, and it is among the most aromatic of Christmas trees species, producing the balsam aroma commonly associated with the Christmas holiday. Leyland Cypress, has dense, soft-textured dark green to grayish-blue foliage. Limbs will not support heavy ornaments unless heavily sheared. It has very little scent but good needle retention. It uses large quantities of water and must be watered several times each day to prevent drying. Available at choose-and-cut operations. Rarely available precut. Eastern Red Cedar is a native tree with dense, finely textured, dark green foliage. The foliage is sometimes prickly and will not support heavy ornaments. It has a very strong aromatic scent. It tends to dry out quickly so you must be sure that the tree has a constant supply of water. It was commonly used as a cut tree in the South can still be found at tree farms though seldom found precut. Douglas-fir, a tree species native to the mountains of the western United States, has been the major Christmas tree species in the western United States since early in this century and is still popular today. Its three-quarter to one-and-one-quarter-inch-long, flattened, soft, green to blue-green needles are attached individually around the twig and tend to radiate out in all directions. Douglas-fir foliage can easily be distinguished from blue spruce by the softness of the Douglas-fir foliage and by the flatness of the Douglas-fir needle, which will not roll between two fingers. The Douglas-fir can be distinguished from Fraser fir and Canaan fir by noting that (1) Douglas-fir buds are bullet-shaped with a sharp point, while those of Fraser and Canaan are round or ball-shaped; (2) the leaf scars left when the needles of Fraser or Canaan fir drop from the twigs are essentially flat, resulting in a relatively smooth twig, while those on Douglas-fir are raised stubs, not as obvious as the peg-like structures present on spruce, but still visible and producing a somewhat bumpy twig; (3) the white banding on the back of the needles of Fraser and Canaan is more prominent than that on Douglas-fir; and (4) when the foliage of Fraser or Canaan fir is crushed, it has a balsamic or turpentine aroma while Douglas-fir has a very mild, almost sweet smell. Among Douglas-fir’s attributes as a Christmas tree are its strong natural symmetry, allowing the production of attractive trees with a wide range in density; its relatively soft, attractive foliage; and its very good needle retention once cut. Whatever species you select, as soon as you get your tree home, you should make a fresh, straight cut across the base of the trunk. About 3/4 inch is enough. After making the cut, you should put the tree in a water‑holding stand or a bucket of water. Don’t let the base of the tree dry out. If you do, a new sap or rosin seal will form. If this happens, you’ll have to make a new cut. If you are not going to put the tree in the house, put it in water in a cool, shaded, protected area. After you put the tree in a stand, keep the stand full of water. In the first 24 hours it is up, a Christmas tree may absorb a gallon of water. After that, it may take up to several quarts a day. Though some folks say that putting bourbon, honey, Sprite, aspirin, commercial additives, and homemade concoctions in the stand will keep the tree fresh longer, researchers say there’s no proof that this will really work. In fact, it may be harmful. Keep your tree cool and away from drafts. Don’t put it near your fireplace, a heat source or a television set. Before hanging lights on the tree, be sure that the cords and connections are working properly. Don’t forget to unplug lights when you go to bed or leave home. 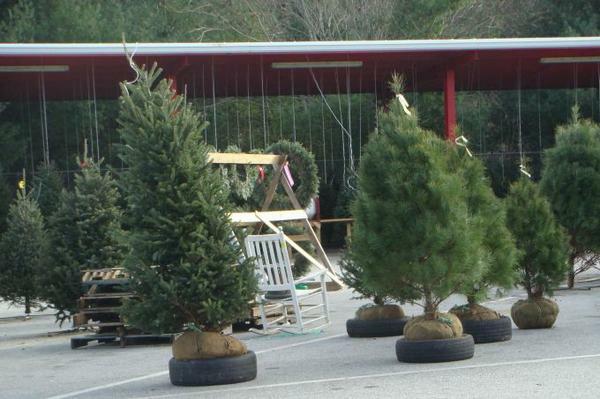 Balled and burlapped Fraser fir and white pine at the Farmer’s Market in Asheville, NC.